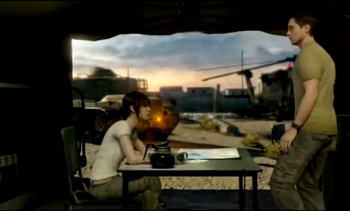 Sony has unveiled a new Beyond: Two Souls trailer at its E3 2013 conference. When Beyond: Two Souls was first unveiled, it was shown off to gamers as something of a supernatural adventure game. The game's protagonist Jodie, played by actress Ellen Page, was being pursued by law enforcement forces that she fended off with mysterious powers that were, without question, not of this world. Much of what we've been shown since has reinforced that tone. Today, however, at Sony's E3 press conference, gamers were treated to a new trailer that showed off a very different side of the game. Beginning with Jodie being entered into a CIA military school it followed her training and fighting via notably conventional methods. This was followed by a sequence where Jodie was sent on a mission to take down an African warlord that saw her sneaking and fighting foes without so much as a hint of the supernatural to it. We had seen similar training footage in the past, but it's still interesting to see the different routes the game seems primed to explore. While certainly showing us something new about Beyond: Two Souls, this new trailer also raises more questions about the game and the nature of Jodie's powers. Moreover, the trailer looked, at parts, more than a bit action-focused, which leaves us wondering how similar we can expect Beyond to be to Quantic Dream and David Cage's last effort, Heavy Rain. Gamers will have their chance to find out this year, on October 8th when the game launches on PS3.